This is a round-up of recent information I've been sent by several collectors. Thank you all. This does not (intentionally) duplicate anything that has been in previous entries or comments on those entries. 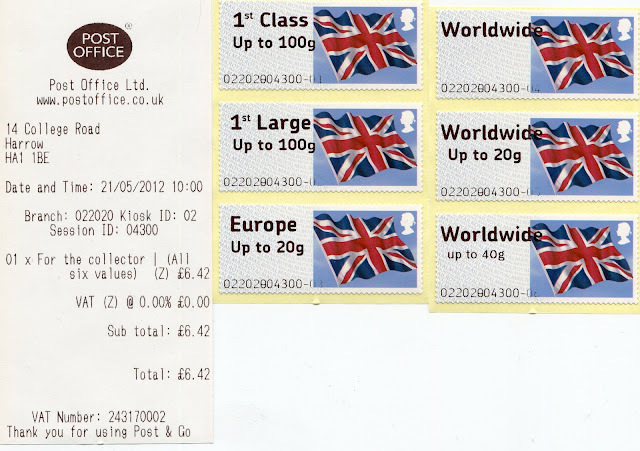 Despite statements that all faults on Post and Go machines using the original font had now been corrected Harrow's kiosk 2 dispensed Flag stamps on 22 May with the large font and missing weight from the 10g Worldwide value. Blackfriars London SE1's machine had Pigs – the receipt has 'newvision®' at the foot. Flags Presentation packs were available at William IV/Trafalgar Square (015010) but limited to only 2 per customer as they were waiting for the rest of their stock. Other offices canvassed had Flags installed. 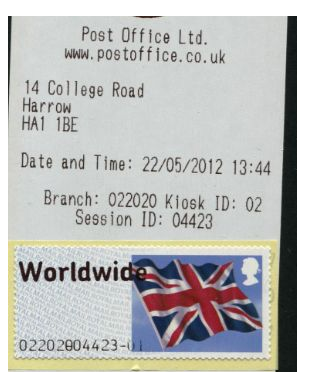 Update: Darley Street Bradford installed Flag stampson the day of issue when requested to do so. "St Albans (010033) were selling the Pig Faststamps on the 25th April. Font 1 was in use on this kiosk. On the 24th, Trafalgar Square (015010) was using Pigs on all four kiosks but kiosk 4 was giving problems. Aldwych (010011) and Broadway (008010) were using Pigs on all kiosks." "It appears that there are now 5 variants to the sheep P&G pack, only the Jacob bread to appear first in the strip. On closer inspection of the images on ebay, there appear to be different numbers after the 002012 02, 03, 04, which are presumably the month that the strip was produced." I haven't had a chance to verify this, and nobody else has mentioned it. All those currently on eBay appear to have 002012 02. Please take a look at your packs and let me know the coding - thanks! St. Albans (010033) now has the Machin head Post & Go label back in their machine. Where did the Flags stamp go? I think the answer to my question is that there may have been an actual problem with the roll. I know they had a similar promblem on the Bognor Regis machine back at the time of the Birds No.3 issue and in the end had to take it out and revert back to the Machin head rolls. I'm not sure but the roll may have been slightly too wide for the feed out part of the machine. Anyway at a later stage the machine had a part changed and the Birds No.3 roll worked fine. 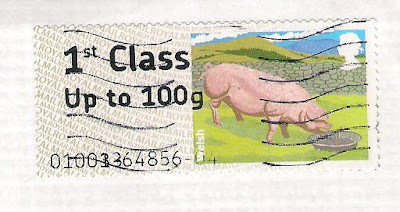 Thank you; I think we have had sufficient reports now to demonstrate that all the Sheep are 02 (Issued in February) while the Pigs are 04 and the Flags are 05 for April and May. They also have / had the Flags Large Font Error !